The dishes are always cooked perfectly - crispy outside and tender inside thanks to our SCS TRIPLE PRO System. Uniform cooking for all kind of recipes - even for delicate cooking. The large blue, backlit display allows you to select and set all cooking functions with ease. Increasing your passion to be a masterchef in your home, 50 different recipes - from starter to dessert - are available in the dedicated app. Thanks to the electronic thermostat and our insulated double glass door, dishes are always cooked with the right temperature without heat loss. Your preferred dishes in less time without wasting energy. 6 different cooking functions (plus defrost) to turn every recipe into something special from starter to dessert. 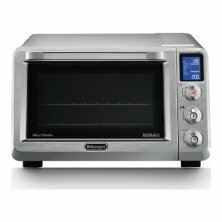 With this electric oven, the dishes are always cooked perfectly - crispy on the outside and tender on the inside. The large blue, backlit display allows you to select and set all cooking functions with ease. It has 6 different cooking functions (plus defrost) and it comes with a crumb tray, 2 wire racks, a bake pan and a pizza pan.